This is our last weekly update for the year 2018. During the year 2018, the SEO domain saw some major revelations in terms of Google updates and web content optimization techniques. Recently an article was published on the Search Engine Land that had details about Bing supporting the ETag/If-None-Match. John Mueller from Google confirmed that Google also supports the ETag/If-None-Match. However, rarely websites are seen using it and mostly it is replaced by the If-Modified-Since tag. Last I looked we supported that, though most sites seem to use If-Modified-Since more. You can find a more technical description on this in Mozilla developer console. I doubt it. There are a lot of topic areas with a ton of content, but sometimes people still find a new spin. To include your images in the Google Image Search you have to make not only the image is indexed but the page it is included in is also indexed. If either one of them is not crawled or indexed for some reason, then Google the image will not appear in the image search. I suspect there’s something not quite working as expected with your web page removal. In order for an image to be shown in Google Images, we need both the image and an associated landing page indexed. If the landing page has been removed (or temporarily hidden with the removal tool), then we wouldn’t be able to show the image either. My suspicion is that there are multiple landing page URLs involved (sometimes this can be hard to spot, with subtle differences in the URLs of the pages), and one of them has been removed, but the others are still indexed. If that’s the case, work to get the other landing pages removed as well, then this should result in the images also not being shown (you could also take it further and also remove the image URLs if this is on your own website). Sometimes this takes a bit of practice, but it sounds like you’ve already been able to get one version removed, so you probably “just” need to focus on the exact URLs involved, and clean those up too. If you worry too much about the URLs of your posts and pages, Google veteran John Muller advises you otherwise. I wouldn't worry about keywords or words in a URL. In many cases, URLs aren't seen by users anyway. We already know that use of keywords in URLs is a very small ranking factor as it was already mentioned by Mueller in 2016. Once, again we would like to point out that quality content is the only prevailing SEO factor you need to care about. 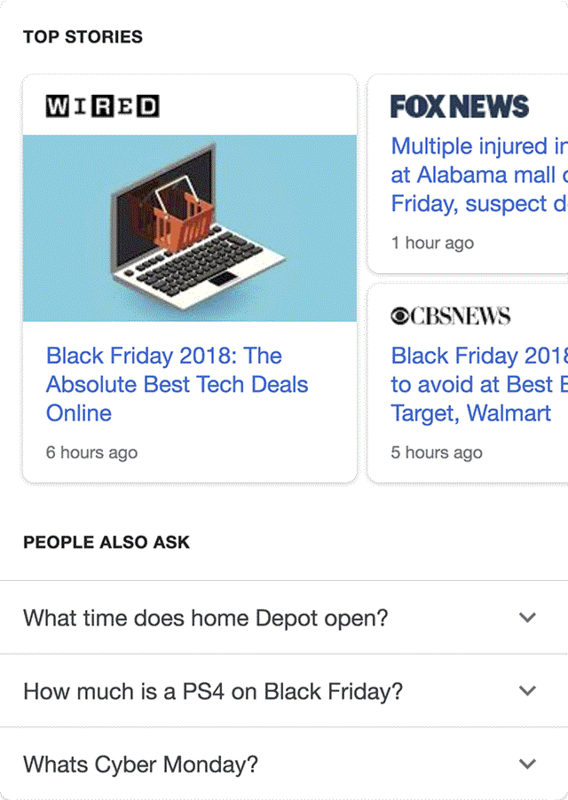 A major update of this week, Google announced that it has introduced a new supported structured data format the Q&A pages. 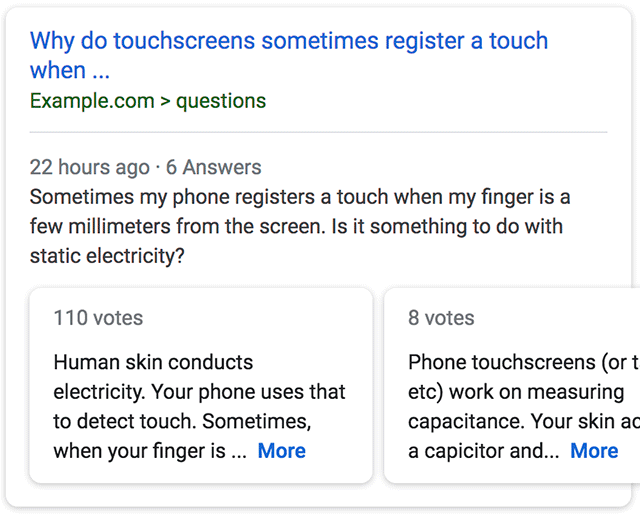 It is a reworked design for the question and answer format snippets carousel that you see presently in Google search results. The new design allows you to slide through answers to questions from Q&A pages. It is not a new addition and had been around for a year now, but Google has now published official structured data markup for it. You can know everything about the new markup here. Q&A Pages are web pages that contain data in a question and answer format, which is one question followed by zero or more answers to the question. For content that represents a question and its answers, you can mark up your data with the schema.org QAPage, Question, and Answer types. Properly marked up pages are eligible to have a rich result displayed on the search results page. This rich treatment helps your site reach the right users on Search. This is designed for social news sites, expert forums, and help and support message boards are all examples of this pattern. Google announced that on December 13, 2018 it will be removing many old search console reports. These reports are already replaced by the new Google Search Console reports. There will be some more removals from the Search Console like the Sitemap report in the future. 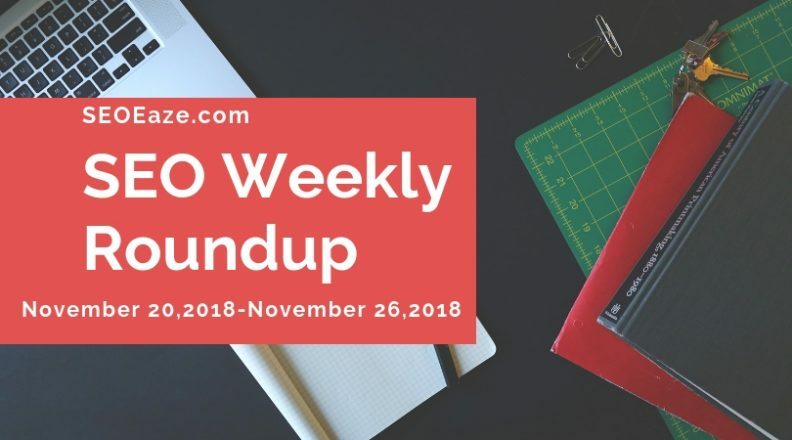 Earlier in the month of November there were a series of small updates that might have been the successor of the Google ‘Medic’ algorithm update. But Google clearly stated in one of its tweets that small updates are continuously made to the Algorithms to ensure best search experience. In the middle of the month Google introduced web.dev online tool. You can use this tool to measure SEO of your sites. The tool is said to be an instrumental addition to the suite of already massive tool kit available for webmasters to make their websites SEO friendly. We published the details of the tool in this post. Accelerated Mobile Pages were a focus this month with Google introducing a development in AMP results. With this update Google has started showing Publishers URL instead of cached Google search results URL. For now, this functionality is available on all modern browsers and mobiles. Know more about this update here. Even one of the Googlers by the name of Dong-Hwi Lee posted a rather large FAQ list in the Google Webmaster Forum addressing the questions related to search engine indexing and AMP. Some webmasters were concerned over the pushing down of the search results with this feature. However, as the update is implemented only for top stories it should really not be a concern. Moving on, late in November Google’s John Mueller revealed that redirected pages are not indexed by Google. We generally don't index URLs that redirect, so that seems to be working fine. This should be a no brainer for most of you as it does not make any sense to index redirect pages as they offer no search value or information. Not only Google but Bing also follow the same procedure. The New Year clock has started ticking with December marking the end of 2018. 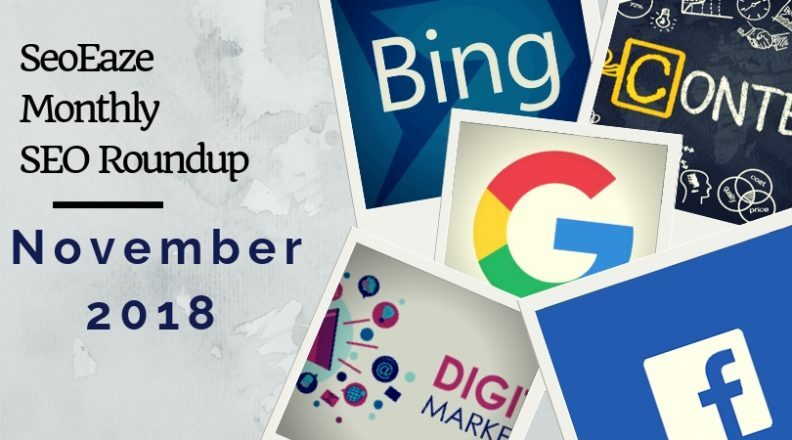 From SEO’s perspective, this year had a lot to offer in terms of smarter search engines, changing the scene of digital marketing and evolving social media channels. Now, this is time for yet another weekly SEO roundup to catch up with all new that has happened in the past week. For a better understanding of the AMP, a Googler, Dong-Hwi Lee has posted a rather large FAQ list in the Google Webmaster Forum addressing the questions related to search engine indexing and AMP. In general, how long does it take for AMP pages to be indexed and served from Search? Is indexing different by page type – i.e. home page vs. product detail page? What is the impact of AMP on ranking? Why do two results appear (AMP and non-AMP) when I search? Should I tag my AMP pages any differently in this scenario? Desktop site (www), mobile site (m.) and AMP pages (on m.) when AMP points to m. and m. to AMP. Is AMP crawling coming off my crawl budget? You can get answers to a lot of your AMP related questions directly or indirectly going through this FAQ post. (2) robots.txt parsing is not 100% consistent across all the tools. The almighty knowledge panel that we see on the right side of search results is seen disappearing for some searchers. In a recent Google Web Search Help forum, the search giant confirmed testing SERPs without a knowledge panel. The first week after the Thanksgiving and holiday mood is all set in. For SEOs all across the globe it is the time to work towards driving more sales to ecommerce during the festive spirit. Last week was quite complacent with no big revelations from Google or any other search engine. That being said, some users saw the Double Carousel View in Google Top Stories. This is an experimental feature that we suppose will be fully implemented after successful testing. Available only for mobile users, you usually see top stories in Google in a single row that you can flip through. But here’s how the two-row carousel view looks like in Google top stories interface. Of course, some of you might be troubles with pushing down of the search results but for this type of query is ok to have online newspaper like design. Probably most of you already know this for a fact but John Mueller made is straight clear for someone in doubt that redirected pages are not indexed by Google. So if you direct a page A to another page B, no content on page A will be indexed instead Googlebot will skip page A and hop directly to page B. Not only Google but Bing also follow the same procedure. Usually we're just ranking them because of other factors – getting one thing wrong doesn't mean you'll never show up in search (lots of sites get things wrong, but they're still useful). It means if you are reinforcing SEO of your website positively even when there is some spamming like keyword stuffing by mistake, you still can rank in Google. John replied for a query where someone complained that one of the websites doing a lot of keyword stuffing still ranks well in Google. John added to his reply that lots of sites get things wrong but they are still helpful.